What Are Your Thoughts on the New Sheik? 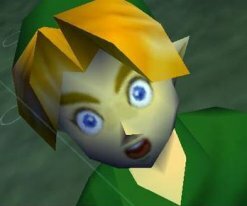 Personally when it comes to looking at the graphics of Ocarina of Time 3D I’m struggling to get past the mouth open, awe type expression. Best way to really describe it is this I guess. However, those who have managed to get past that stage have all commented on the new design of Sheik. Sheik is personally my favorite character in all of Zelda, so I’ve looked forward to seeing him in 3D. But with the redesign how much of a “he” is Sheik? Many people have noted that the new model of Sheik looks significantly more feminine than in the original version. We all should know by now (if not spoiler alert), that Sheik is portrayed as a “young male”, despite being Princess Zelda in disguise. In the past I’ve almost thought of it more as a magical disguise than a costume based one, but I guess a feminine look could go hand in hand with “young male”, making it more literal. Zelda does say she “passed herself off as a Sheikah” which alludes to it being more of a physical disguise. The original Sheik, although being notably short compared to Link, didn’t appear as notably feminine. Many fans have pointed out that Sheik looks at lot more feminine in the 3D remake. I didn’t pick up on it myself, but it seems somewhat evident once its been suggested to you. It makes you wonder if its a conscious change by Grezzo, or we’re just noticing it more. Or maybe now that the whole Sheik is Zelda mystery isn’t so much of a mystery anymore, it allows for them to be more realistic. It makes me wonder if new players will buy the new Sheik, and not pick up on him being Zelda if they didn’t already know. Maybe Sheik is going to be passed off as a young female this time around, which I don’t quite know why he/she/it wasn’t the first time around. Maybe Zelda likes to cross-dress. Regardless, when Sheik reveals himself as Zelda will forever remain one of the greatest moments in gaming, even if for me it was a great disappointment to find out my favorite character was “just” Zelda. What do you think of the new 3D Sheik? Do you think he looks more feminine? Let us know below.